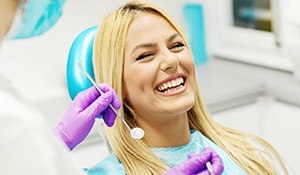 There are essential guidelines that patients know to follow when maintaining their best smile – brushing twice a day, flossing at least once a day, and visiting the dentist regularly for checkups and cleanings. At Boyles General Dentistry & Implant Center, our dentists want to introduce you to a bigger world of services that all help to prevent dental problems at their earliest stages. Your teeth deserve quality support at every stage of life, so don’t hesitate to contact us in Midland and schedule an appointment! Patients of all ages should be undergoing a professional dental checkup and teeth cleaning at least every six months, or twice each calendar year. 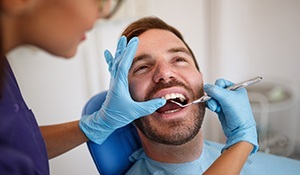 This is because many dental problems can develop in ways an untrained eye won’t notice at first, and our dentists will have the opportunity to identify them early on during these important appointments. First, our team will start by capturing diagnostic X-rays before carrying out a thorough visual examination. Dr. Boyles and Dr. Etheredge won’t leave any stones (or teeth) unturned, reviewing all of the existing dental structures, the gum tissue, the jaw joints, the bite, any existing restorations like crowns and fillings, and more. Then, we’ll perform an in-depth cleaning in order to eliminate decay-causing plaque and tartar accumulations from the teeth and gums. Finally, it will be time to sit down and discuss our findings with you, recommending any necessary services and formulating a personalized treatment plan if needed. 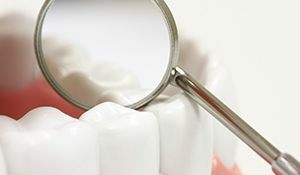 Periodontal disease (also known as gum disease) is one of the common oral health problems in the United States, as well as the leading cause of tooth loss among American adults. Reversing this infection as early as possible is crucial, and Boyles General Dentistry & Implant Center can assist you. Periodontal screenings are an essential part of every regular checkup, and effective therapy options like scaling and root planing and antibiotic therapy are available when needed to revitalize a patient’s oral health. Bruxism (which is the proper term for teeth grinding) is highly common among people of all ages. You may not even know you’re a victim because it usually only happens at night as patients rest, leaving you to wake up with chronic jaw pain and worn-down teeth. Thankfully, our dentists know all of the tell-tale signs that point to bruxism. 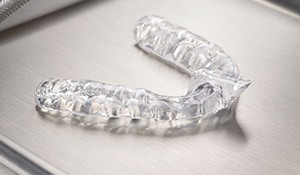 We’ll design a personalized nightguard that can be worn comfortably during sleep and will establish a strong barrier between the rows of teeth. Any grinding will be kept to an absolute minimum! If you’re an active athlete who regularly plays sports where physical contact with objects and other players is a possibility, we strongly suggest that you invest in a sportsguard. 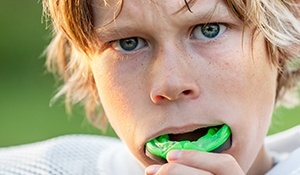 These oral appliances can protect vulnerable teeth from harmful impacts, and some studies have even shown that it may reduce the severity of concussions! While store-bought mouthguards can be excessively bulky and uncomfortable, our custom-made models will provide exceptional reliability. Regular tobacco use may lead to developing oral cancer, but nearly 25% of victims don’t engage in this activity or any other known risk factors. That’s why undergoing an oral cancer screening as a part of your regular dental appointments is so important. Our dentists will review the oral tissue for suspicious symptoms (such as discolored skin, slow-healing sores, or strange crusts and lumps) and raise the alarm if anything concerns us. By identifying cancerous cells early on, we can maximize your chances of a successful recovery. Dental sealants are tough, plastic-based “seals” that our dentists can use to cover the chewing surfaces of back teeth. These areas are likely targets for chewed food and harmful bacteria to settle in over time, and younger patients often struggle to brush them properly because of their tricky location to boot. A few sealants can lend a big helping hand by blocking out these substances and reducing the risk of cavities.